The Draped Bust Half Cent and its many varieties. 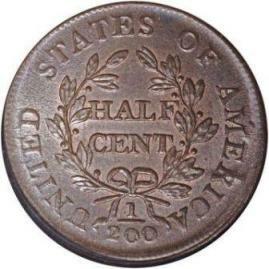 The draped bust half cent was designed by John Eckstein. It was produced between 1800 and 1808. The obverse design was inspired by a portrait of Mrs. William Bingham and was initially drawn by Gilbert Stuart one of the more prominent artists of the time. 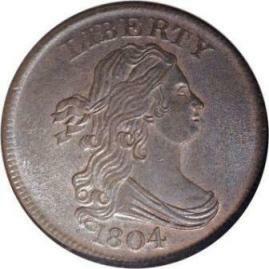 The reverse of these small copper coins have essentially the same design as the 1794-97 Liberty Cap Right coins. They have a laurel wreath with the words HALF CENT in the center and the fraction 1/200 at its base. and the edge is plain. Also, they are made of 100% copper and weigh 5.44 grams. Approximately 90% of the coin blanks came from the English based company Boulton and Watt. The remainder of the copper came from cut-down Large Cents. 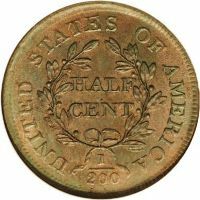 A few minor varieties of these half cents include the 1804 "Spiked Chin", the 1804 crosslet 4, and also stemless versions in 1804-1806. 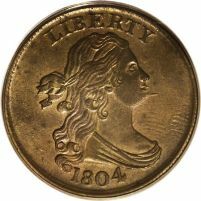 The 1804 "Spiked Chin" variety is actually an error. It was caused by a mint engravers tool slipping and damaging the die that the coins were to be struck with. 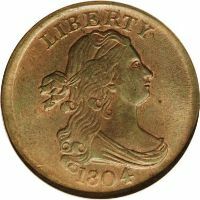 This error is very similar to the 1795 liberty cap with punctuated date. The 1804 crosslet 4 (also illustrated on the Spiked Chin version above) is not a result of a mint error. It is merely a change in design from the 1794 version. I include a photo of the plain 4 version (right) to show the difference. The stemless wreath variety occurs in 1804-1806. It is a result of mint engravers working very long hours and forgetting to add the stems on the reverse design.